Muesli has gone upmarket. For upwards of $40 a kilo, you can buy oats mixed with macadamia, goji, mango or cacao. Whatever exotic taste you desire, the muesli market seems to have it covered. We’ve compared the nutrition of 124 products — see how your favourite muesli stacks up against our criteria and other brands. When we last looked at mueslis in 2012, we found healthier options were slim pickings. 80% were high in sugar and wouldn’t qualify as a healthy start to your day by any stretch. Five years on, some manufacturers have lifted their game but others have gone backwards. On average, mueslis in our survey contained 17.2% fat. That compares with 12% in 2012. Saturated fat levels were also higher, up from 2.9 to 4.1%. This isn’t surprising given the increased number of gourmet mueslis on the market. Gourmet offerings tend to have more nuts and seeds, which increases fat content, although the majority of this fat is “good” unsaturated fat. Pure Delish Raspberry & Maple Nut Nograin-ola. Most of the fat in these products is from nuts and seeds, rather than added oils. We also found 29 cereals were high in saturated fat. Ceres Organics Paleo Breakfast Crumble Cacao Spice had a whopping 17.2% saturated fat — weight-for-weight that’s more than Griffin’s Toffee Pops Original chocolate biscuits. Ten other products were more than 10% saturated fat. They were all expensive gourmet products costing $40 or more per kilo. The sugar in muesli comes from added sugars, such as honey, glucose and maltose, and dried fruit. Dried fruit contains other nutrients and fibre but some fruit pieces have added sugar. On average, mueslis we looked at were 16.7% sugar, compared with 19% in 2012. However, of the 34 products from our 2012 survey still available, 3 have significantly more sugar — Countdown Toasted Muesli and Hubbards Berry Berry Lite have 20% more and Pams Toasted Muesli 44% more. The worst sugar offender this year was Alison Holst Rise & Shine with more than 40% sugar. Alison Holst Honey Toasted Muesli, Pams Finest Apricot Cashew Almond Luxury Muesli and Pams Toasted Muesli are 30% sugar. Hubbards Natural Muesli 5 Grains & Hazelnut and Hubbards No Added Sugar Muesli Date & Almond were the only low-sugar and moderate-fat options with no more than 5% sugar. Like our previous survey the majority of mueslis are low-sodium options (less than 120mg per 100g). None had high levels. With its nuts, seeds, oats and dried fruit, muesli is a good way of boosting your fibre intake. Mueslis with 8% fibre can make a “good source of fibre” claim. Nearly two-thirds of the mueslis in our survey tick this box. “Cluster” cereals, such as Select’s Free From Gluten Original Crunch and Berry Crunch, Select Clusters Vanilla Almond and Hubbards Simply Muesli Clusters Berry tend to be lower-fibre options, because they usually have fewer nuts and seeds than other mueslis. Health star ratings have been appearing on more products in the cereal aisle. The ratings are intended to give consumers at-a-glance nutrition information about packaged foods. But the system isn’t without its flaws. Foods high in sugar or saturated fat can still qualify for high star ratings. The rating calculations also don’t distinguish between added sugars and those naturally present in a food. For example, Select Toasted Muesli Fruit & Seeds qualified for 4 stars even though it was 26.9% sugar. Other high-sugar mueslis also managed 4 star ratings (see “Other products”). Five mueslis qualified for 5 health stars. While all were good sources of fibre, just one was also a low-sugar, low-saturated fat choice: Hubbards Natural Muesli 5 Grains & Hazelnut. The others had moderate levels of these nutrients. We’ve called for changes to the rating system so it gives consumers better information to make healthier choices. Our main recommendation is for star ratings to be capped at a low level on foods high in sugar, saturated fat or sodium. We analysed 124 muesli labels. We’ve used green ( ), orange ( ) and red ( ) symbols to show the fat, saturated fat, sugar and sodium in the product. A red symbol means the product has high levels; green means the food has low amounts; orange fits somewhere in between. Our traffic light criteria have been developed by UK health agencies. 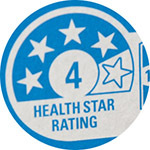 We've also listed the health star rating. Ratings range from half-a-star to 5 stars. We weren’t able to calculate star ratings for all products. 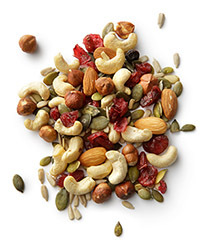 The percentage of nuts, seeds and dried fruit in a product is required to do this. Manufacturers don’t have to display this information unless the ingredient is a characterising one. Some companies said they won’t be using ratings because the system doesn’t consider wholefood ingredients or how processed a food is. Companies can opt out of the health star system as it remains voluntary. 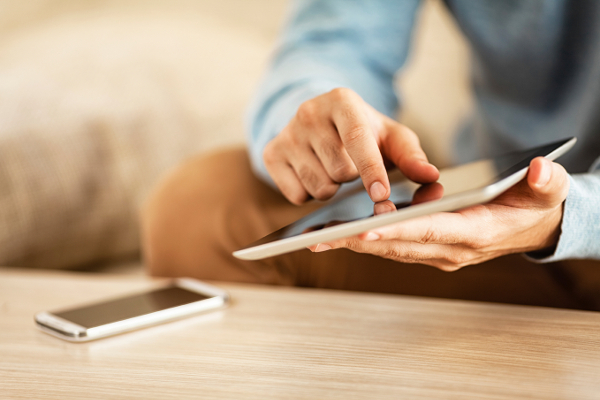 You need to be a Consumer member to view this content. If you're looking for a lower-fat lower-sugar muesli, check the nutrition information panel (usually found on the back of the packet). Many mueslis contain vegetable oils in addition to the fats in nuts and seeds. Less than 17.2g of total fat and less than 4.1g of saturated fat is lower than average. The ingredients list will help you identify whether the fat comes mainly from nuts and seeds or from added oils. Most mueslis contain added sugars, sometimes disguised as honey, golden syrup, maple syrup or glucose. Some of the dried fruit used in muesli may also be sweetened with extra sugar. Check the ingredients list for added sugar. Less than 16.7g of sugar per 100g is lower than average.